Paint chips are all over Pinterest! 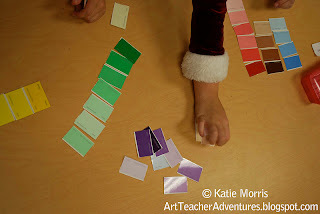 I've seen all sorts of projects using them and while I would feel guilty taking enough from the store for 100+ students to use, I didn't feel too bad taking just one of each primary, secondary, and neutral color. (I also took an extra black to help illustrate value.) I laminated the samples, cut each strip apart, and put them in a pencil case with the following directions to be used during an 8 minute rotation. 3. By yourself, pick a pile of one color, like all the oranges. Put the rectangles in order from dark to light. 4. With extra time, invent your own game to play with them! In the photo above, the directions are just taped to the bottom. I have since laminated the directions and added another piece of laminated paper with some vocabulary on it. Since I just had groups working on this for about 8 minutes, it was a good activity. The students were proud when they accomplished 1-3 and got pretty creative inventing their own games with #4. One group invented a game that was kind of like Go Fish but with colors and I'm sure there were several other good ideas. 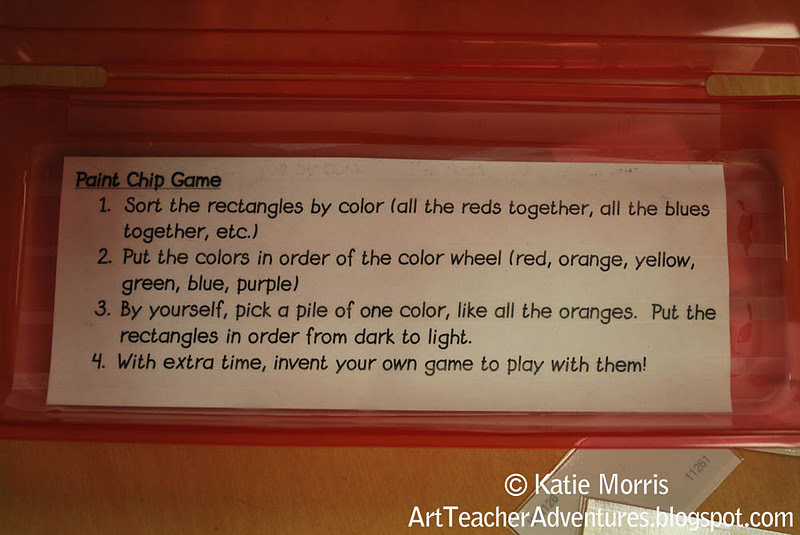 This was a good way for students to work together to play with color and value and use their imagination and creativity to invent a game. This is great. I've also collected some of these lessons on Pinterest, and after one trip to Lowe's and a handful of paint chips in my pocket, I realized just how many of these things I would need for the kids to make paint chip cities, and I felt guilty going back for more. So I wasn't sure what I would do with the ones I had. 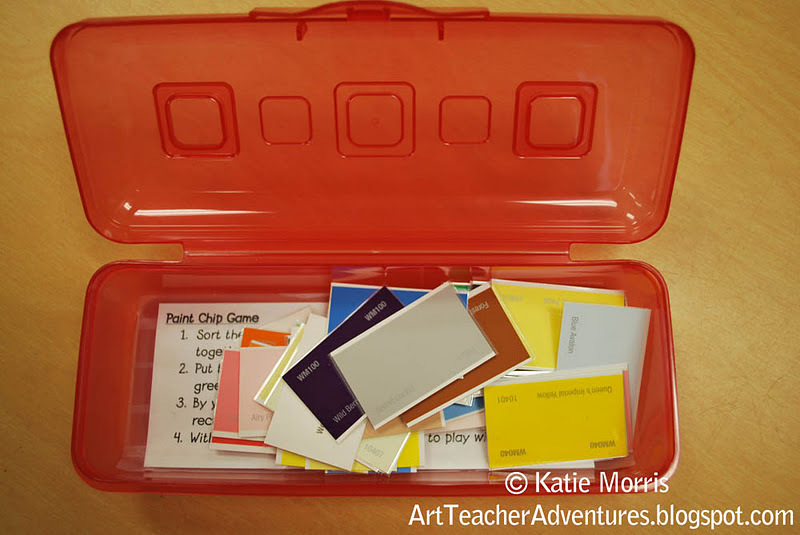 Your game is a great idea for kids who are done early and need an activity, and doesn't require me to clean out every paint chip from every home improvement store in town! Thanks for sharing it. The Lowe's paint dept. gave me a bag to carry all my paint chips in. I also have a parent at my school who works at a home improvement store and bring me boxes of paint chips. They absolutely do not care how many you take so don't feel guilty!!! Does anyone sell paint chips already packages at Hobby Lobby or some where? That would be a great selling idea. I'm a huge fan of this game and I haven't even played it yet. I've been an art teacher for 10 years. I found that having games ready to play really helps kids in art. Even as an adult, I'm not great at making on demand. Sometimes it's good to play a game and let my creativity flow a bit. I don't feel guilty taking the paint chip strips because I ALWAYS buy something whenever I go to Lowe's, Home Depot, Ace Hardware etc. The corporations who make the paint provide those strips to the stores at no cost, display cases included so don't feel guilty! thank you, it's really help my thesis. but could you help me to send me some e-books, articles, journals or anything that related to the paint chips. my thesis is about the use paint chips in teaching descriptive text. Find a local architect or interior designer. They are always getting new samples and purging old ones. They are a great source for other things too, like fabric samples, tile samples, wood flooring samples, Formica samples, etc. I just saw this activity while searching pPinterest for sub plan ideas. I think it is brilliant and will be making a couple of these myself for the students to play. Thanks for sharing.